Here's How Old School Celebs Showed Up & Showed OUT At The BET Awards! Here’s How Old School Celebs Showed Up & Showed OUT At The BET Awards! Okay ILOSM family, we’ve gotta call it how we see it and how we see it is sometimes when it comes to these new school/old school collaborations, some of these youngins can hold their own and some of them need to step away from the stage and stay in their lane…at least when the Old Schoolers are on it. We don’t mean to sound so harsh, because we have no problem giving credit where credit is due, but we still have to give our honest opinions. With that said, let’s take a look at how these Old School artists showed up and showed OUT at the 2015 BET Awards last night. First up is Patti LaBelle! Patti stepped onto that stage to sing “If Only You Knew” with K. Michelle and Tamar Braxton, that’s when it was clear to see the difference between a seasoned artist, who’s been doing it for 57 years, and two artists who are pretty new at this (in comparison to Patti). 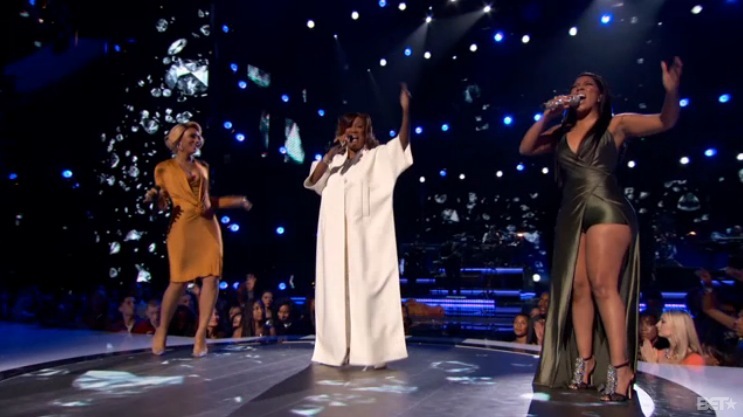 Don’t get me wrong, K. and Tamar can sing, but Patti showed up and showed OUT and I ain’t mad at that one bit! In case you missed it, check out Patti kiilin’ it on stage. You can start it at the 4:44 mark if you want to skip through the other two ladies’ performances.